A One Korean painting is the premier commercial painters in sydney that offers interior painting, exterior painting, and project management. We have commercial painters that have extensive experience that works exclusively with our commercial and industrial clients, warehouses and other businesses. Trust us to get your new exciting project or renovation meet the highest quality standards. Our commercial painters have hands-on experience, intense focus and comprehensive product knowledge to ensure a safe working environment. We make sure that we use the most efficient access preparation and commercial painting systems and the most suitable commercial grade paints for each commercial Painters Sydney. We are dedicated to providing exceptional customer service, outstanding attention to detail and quality workmanship. On top of that, we make sure that you commercial painting Sydney gets completed on time and budget while exceeding your expectations. Why Choose A One Korean Painting? When you are in business, you don’t have the luxury of waiting because time is money. This is why you should only contact a reliable company for your commercial painting services Sydney. 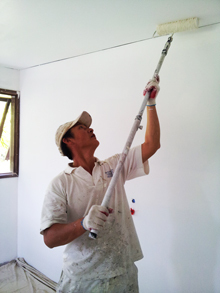 Our experienced team at A One Korean Painting are specialists of all kinds of commercial or residential painting. We know that you want minimum disruption to your business and assurance that your painting project needs to be finished on time and to budget. Guaranteed completion on the specified date. You are assured your business will continue uninterrupted. Top-quality finishes using top-quality paints. You can always put your best foot forward. Hassle-free preventive maintenance painting programs. You can save a lot of money. Fast-response to touch-up service for urgent spot painting. Dedicated project manager, so you don’t have to coordinate every facet of your painting job. Complimentary Color Consultation. You can save your money by getting the right painting products and colors for your project and Sydney climate. You can leave a message on our contact form. If you want to talk to us right now, call our friendly customer service staff at 0450 661 598. We are happy to help and arrange a free site evaluation.